June 8, 2012 at 12:10a.m. Top Rank, March 31, 2012. While Kelly Pavlik has performed well in other cities — he improved to 1-0 in San Antonio after his knockout of Aaron Jaco in March, above — no city has done more for his career than Las Vegas, where he is 11-0 all-time. He’ll try to make it 12-0 when he faces Scott Sigmon tonight. 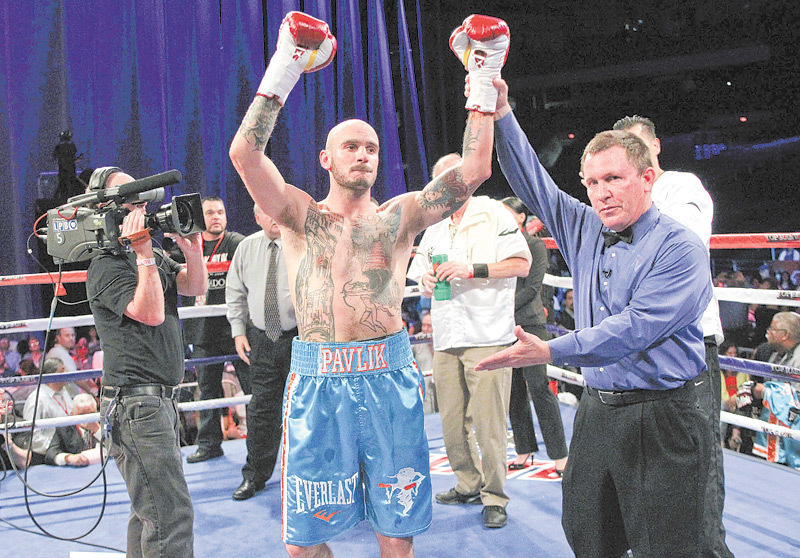 The city of sin has been pretty sweet to Kelly Pavlik. The former middleweight champ has amassed a perfect 11-0 record and recorded arguably the biggest moment of his career, outside beating Jermain Taylor the first time, in Las Vegas. While the size of the venues and media following his career has dipped since his highly-publicized fall from the spotlight over the past year and half, Pavlik still garners attention wherever he goes. “It’s a great feeling to be back here,” said Pavlik (38-2, 33 KOs), who will meet Scott Sigmon (22-3, 12 KOs) in a 10-round super middleweight bout on ESPN2’s “Friday Night Fights” tonight, one night before Manny Pacquiao meets Timothy Bradley. The 30-year-old Youngstown native wore a black T-shirt with his logo and black basketball shorts during Thursday’s weigh-in proceedings at the Hard Rock Hotel and Casino when both he and his Virginia-based opponent tipped the scale at 167 pounds. Sigmon, however, has been bothered by the fallout from his ripping of Pavlik to numerous media outlets and on Facebook, after talks centering on an early spring meeting between the two fell part. “I don’t really know where the ‘war of words’ came from except for me saying one bad thing when the fight fell through,” said Sigmon, a big underdog who hasn’t faced a fighter of championship pedigree in his career. Pavlik — who in his first fight back in nearly a year disposed of Aaron Jaco by second-round TKO on March 31 in San Antonio — said he’s out to prove he again belongs on pay-per-view cards against top-level competition. Top Rank promoter Bob Arum says he’s already seen his pugilist prove he’s sincere in his comeback bid. “I really believe he’s changed his life around,” said Arum, who also promotes both Pacquiao and Bradley. “The reports I’m getting are great. But both Pavlik’s manager, Cameron Dunkin, and new trainer, Robert Garcia, said Pavlik is on the fast track back to stardom. February 25, 2012 12:09 a.m.
February 24, 2012 12:37 p.m.